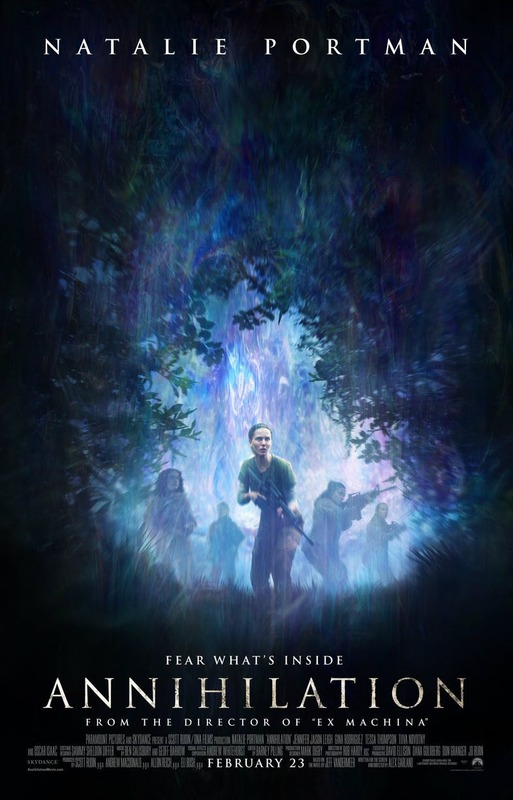 I didn't know much at all about Annihilation (2018) beforehand and, in my opinion, that's usually the best way to approach a film that you have an interest in. I just knew that I loved Alex Garland's previous directorial debut, Ex Machina (2015). But he's real hit and miss with me - while I loved said previously mentioned film, Garland also wrote 28 Days Later (2002) (which I loved when it was released but not so much now), wrote Sunshine (2007) (which I loathed), and wrote Dredd (2012) (which was pretty fun). He also wrote the original screenplay for an upcoming movie based on the video game Halo (which I don't care about). Annihilation is a film based on a book with an incredibly intriguing premise, that of a team of women who enter another...realm, shall we say (referred to as "The Shimmer"), to explore it and try to understand why all but one man from another team that entered did not return. What they find in The Shimmer is otherworldly and defies logic. I'm not a huge Natalie Portman fan (she's honestly neither here nor there for me) and she's fine in this, but the rest of the cast is pretty unremarkable (even Jennifer Jason Leigh, who I tend to like). I'm also a little bummed when directors I like cast what I consider so-so big name actors in avant-garde films (Jennifer Lawrence in Mother! (2017) is another recent example). I did find the production design to be excellent. The sets were well-crafted and appealing. The multi-colored flora and oil slick qualities of The Shimmer were beautiful to behold. But I found a lot of the CGI to be just average and I have a feeling that it won't age well. There is one scene with a bear/boar creature which, while intending to be tense and frightening, I just found a bit silly, unfortunately, and I think it was down to the f/x and the execution. There are some other horrific scenes in Annihilation that work pretty well but nothing to keep me awake at night. It's hard to explain exactly, but while I do like sci-fi films that leave a lot open to interpretation, I like the ones that take that approach more because they don't feel the need to raise their questions implicitly out loud. It's a difficult task - to let visuals feed you information rather than just rely on exposition dumps (they are some pretty bad ones in this film). Arrival (2016) is a perfect recent example of a film that expertly accomplishes both intelligent (re: not ham-fisted) exposition and superior visual storytelling. Annihilation suffers from the same loftiness that Ridley Scott's two most recent Alien films do. The final third of the film goes full on trippy and I dug it for the most part but there was a half-hearted H.R. Giger homage that felt out of place with the rest of the film. It could have been something really special, I think, and I do applaud the effort. I would certainly watch it again. And I appreciate that we're in an age of visually arresting hard sci-fi and that there seems to be at least some demand for it. But I found Annihilation to be a bit too much of a mashup of 2001 (1968), The Thing (1982), Invasion Of The Body Snatchers and lots of other sci-fi/horror films and, sadly, not a new classic in its own right. I kind of want to see this but I'm still unsure. Natalie Portman definitely helps motivate me. In all seriousness I loved The Beach(HIGHLY recommend the book) and the 28 Days/Weeks Later films. Which is funny (re: Portman) because I don't think any movie is ever made better *by* Portman, but can be good *despite* Portman.